I have already written about her fondness on books and how she likes to see / read her books. As I said earlier, there is no timing for it. And any body can take the book and show for her. 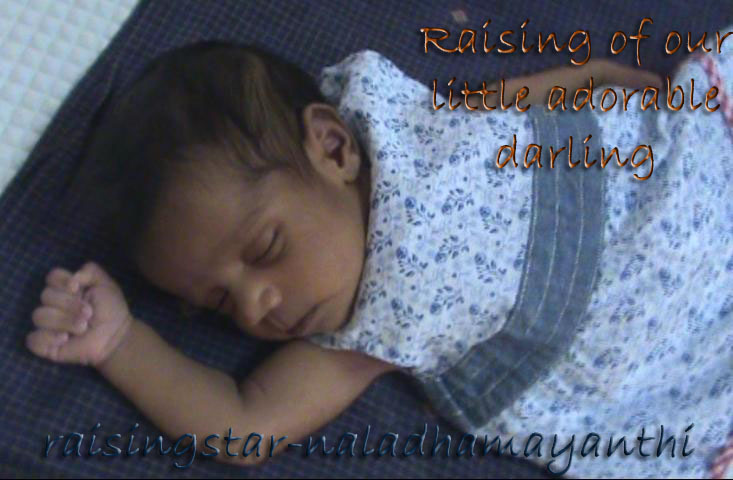 It is not necessarily me or his Dad. Her grandparents can also show her books and tell her what it is. 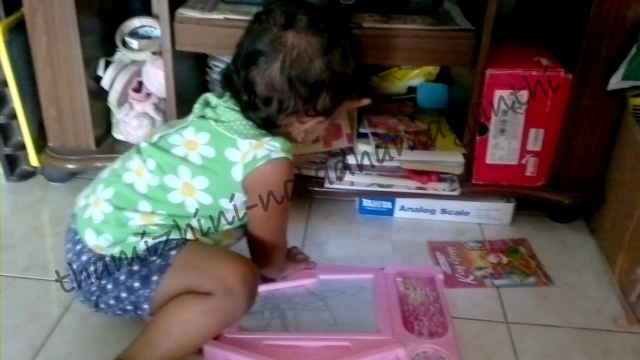 As of now she has many books and she knows almost all the books names. It may not be the exact name of the book but we have put some small names to it. and she has Snoozers, Chikka Chikka Boom Boom, King Geroge, Lord Indra and some of Barbie's book. But these are all yet to start reading as it is bit thin papers compared to that hard books :P Yeah, I'm worried! Even though we don't spend much time for these books, she knows some of the characters like king, puppy, frog and etc on the books by seeing pictures! She loves mainly 3 books here: Brown bear, Animals and Preschool activity books. In Animals book, she knows minimum 3 to 4 animal and bird names per page. As she is yet to talk, we ask the name of the animal / bird and she puts her finger on it. 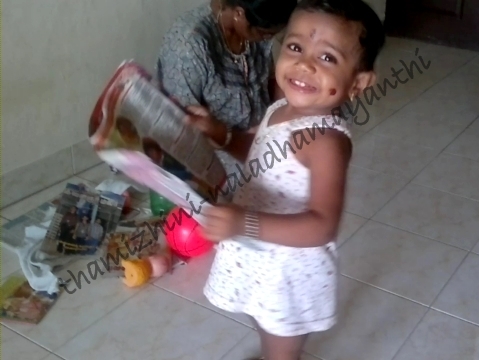 Check out the attached videos like how she used to sit and read her book. If we ask a animal which we have not told her before, she will simply put her finger on any of the animal, but mainly not on the known animal. She never waste a second for showing it to the wrong one, but if she knows she will take some seconds to think / find and show it. Sometimes our conversation will be like this and it is very funny to listen her. Me: Wheres the Animals book? 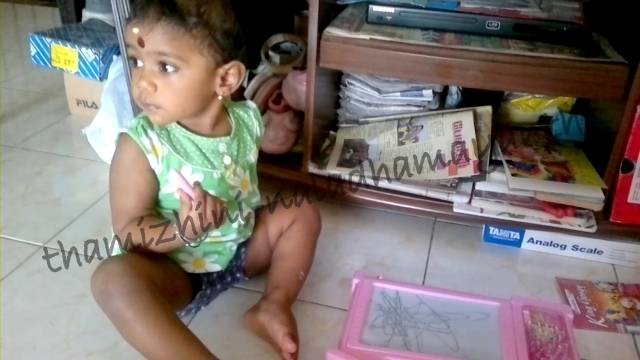 Thamizhini: (Searches for half a minute and) "bye bye" and shows her hand as not found! These days this is usual for her, If something is not found or not able to find it out, she says that is gone "bye bye". 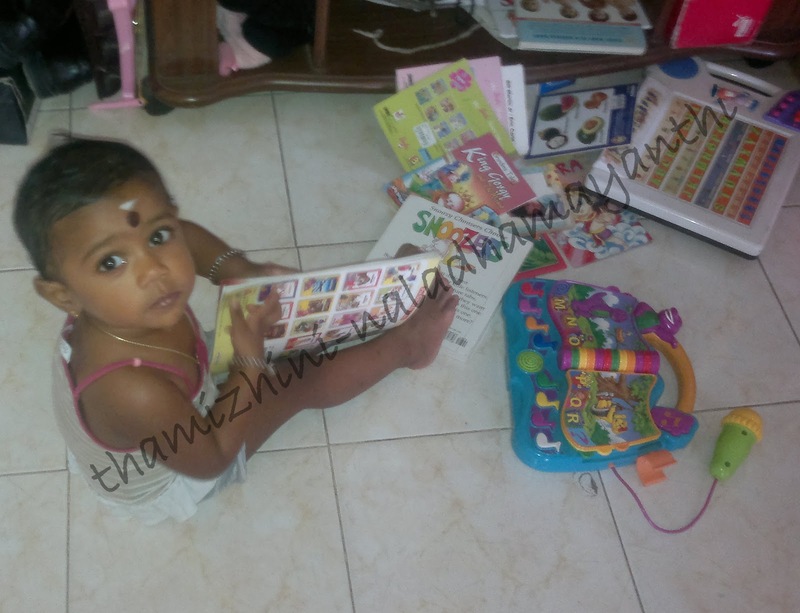 Sometimes she takes weekly Tamil magazines and ask us to read for her. Whatever it is, she likes to see the pictures on it and we have to say something about the pictures. More importantly, even in the night (or I should say early in the morning) around 3 O' clock, she asks me to get a book and read for her. Just think about me, will I be happy for this?